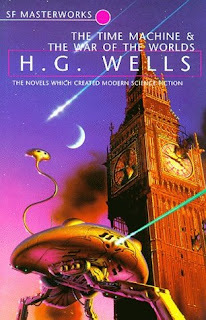 In The War of the Worlds, his 'scientific romance' of 1898, H.G. Wells draws relentless, insistent attention to humanity’s unbounded capacity for deluding itself in the face of self-evident truths. Having scarcely escaped a near-fatal encounter with the invaders, the anonymous narrator reflects on the fact that whereas ‘a few minutes before there had only been three real things before me – the immensity of the night and space and nature, my own feebleness and anguish, and the near approach of death’, now ‘I was immediately the self of every day again – a decent, ordinary citizen’ (p. 123). He goes on to recount in some detail ‘the dovetailing of the commonplace habits of our social order with the first beginnings of the series of events that was to oppose that social order headlong’ (p. 127). The cries of newspaper vendors declaiming the arrival of ‘“Men from Mars”[…] caused no more disturbance than drunkards might have done’ (p. 128). When the nature of the catastrophe does begin to emerge, the author does not stint in his criticism of humanity’s short-sightedness and tendency to view the problems of the future through the lens of the present. Wells’s account of a news vendor’s attempt to sell his papers as he flees, 'a grotesque mingling of profit and panic,' (p. 174) is noteworthy in this regard, as is the memorable depiction of a hapless individual crushed under cart wheels in the midst of his attempt to retrieve a quantity of gold sovereigns that have leaked from his split portmanteau (pp. 193-94). There is something of the nature of an anthropological inquiry about this mode of description, as if Wells is inferring that humanity’s weakness – its belief that everything will carry on as it always has done, regardless of a malign external influence – also carries within it the Darwinian kernel of salvation in that it is scarecely imaginable for mankind to conceive of its own extinction. The inevitable, if temporary, collapse of the existing social infrastructure under the alien onslaught is compellingly imagined by Wells. The pathos of his descriptions are amplified by their gradual transition from the stoically amused, to the horrified and finally to the despairing. Initially, those fleeing from the approaching Martians on that fateful Sunday of Wells’s imagination deport themselves as though they were heading off on a weekend jaunt or pleasure cruise: ‘the respectable inhabitants of the place, men in golf and boating costumes, wives prettily dressed, were packing; riverside loafers energetically helping, children excited and, for the most part, highly delighted at this astonishing variation of their Sunday experiences’ (p. 152). It is not long, however, until things assume a darker cast, and the terrain of the novel is suffused with charred corpses, clouds of lethal viscous black 'smoke' and alien vermillion fauna. Whilst the reader may bring to the text the expectation that they will find a proto-Steampunk vein within War of the Worlds, Wells for the most part draws a veil over the aliens’ construction of the their various means of locomotion and destruction by describing their undertaking the activity for the most part within the craters that their ships created on impact: ‘they seemed busy in their pit, and there was a sound of hammering and an almost continual streamer of smoke’ (p. 132). This does not, however, mean that Wells felt himself incapable of imagining both the appearance of the Martians and their various machines in all their terrifying alien alterity. ‘Can you imagine,’ the narrator asks the reader, ‘a milking-stool tilted and bowled violent along the ground? But instead of a milking-stool imagine it a great body of machinery on a tripod stand’. Such is his description of Martian war machine, ‘a monstrous tripod, higher than many houses’, a ‘walking engine of glittering metal[…] articulate ropes of steel dangling from it’ (p. 138). Elsewhere the narrator offers a Fleet Street description of the same as 'vast spider-like machines, nearly a hundred feet high, capable of the speed of an express-train, and able to shoot out a beam of intense heat' (p. 169). The author also does not shy away from the difficult task of describing the Martians themselves: 'huge round bodies – or, rather, heads – about four feet in diameter, each body having in front of it a face. This face had no nostrils[…] but it had a pair of large, very dark-coloured eyes, and just beneath this a kind of fleshy beak[…] In a group around the mouth were sixteen slender, almost whip-like tentacles, arranged in two bunches of eight each' (pp. 218-19). Attempting to return the carriage he has borrowed in order to convey his wife to safety, the narrator finds himself thrown together for a surprisingly long period of time with the highly disagreeable person of ‘the curate’, a rather less than subtle caricature of the clergy, and paradigmatic of the author’s distaste for the ecclesiastical and its reductive philosophy. Wells describes him mercilessly as ‘one of those weak creatures, void of pride, timorous, anaemic, hateful souls, full of shifty cunning who face neither God nor man, who face not even themselves’ (p. 226). His fate is described with some relish by the author, and whilst the social mores of the time may have required that his protagonist blench at the moral implications, the author appears to have no such qualms, and the writing hand, having writ, moves on without so much as missing a punctuation mark. The War of the Worlds is a relatively quiet, small-scale meditation on how an individual may respond to the trauma of unimaginable disaster rather than a gung-ho proto-military SF novel, and an historic and memorable entry in the SF Masterworks series. Note: a separate review of The Time Machine will follow in due course.